The journey from Tamanghasset, the southernmost airstrip in the Algerian Sahara, to the border of the Republic of Niger is 280 kilometers as the crow flies. Our team, consisting of two geologists, an archaeologist and two local aides left “Tam” as the locals call it, just before sunrise. We passed the foothills of the mighty Ahoggar Mountains and reached the desolate outpost of In Guezzam by nightfall. As of early 2002, In Guezzam is the single open frontier post connecting Algeria and the Republic of Niger. Wrecked vehicles from the last five decades litter the track, which is called a “piste” in the Sahara, and tell about the fate of those who got stranded enroute. Burned tires show evidence of last desperate attempts to smoke-signal a position to the all to often not existing rescuers. At In Guezzam we join with Aoutchiki Kriska called “The Locust”. The Tuareg tribal leader and biologist received his war name for his sucessful battle against a plague of locusts haunting the willows of his clan in the early eighties. 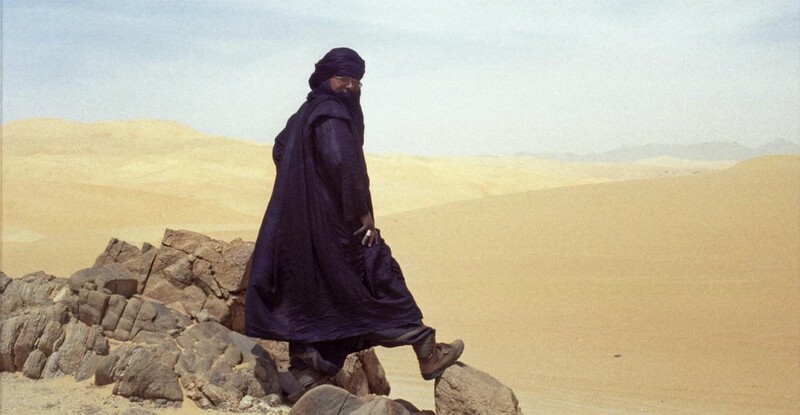 As one of the leaders of the Tuareg rebellion in 1991 the folk hero knows the central deserts like no other. After the cease-fire agreement with the government which Aoutchiki signed together with the famous Mano Dayak in 1995, the weapons remain silent. Today the situation is largely stabilized. But still the deserts on both sides of the Air Mountains where the rebels once retreated after their raids, are the most untouched and aboriginal regions on our planet. 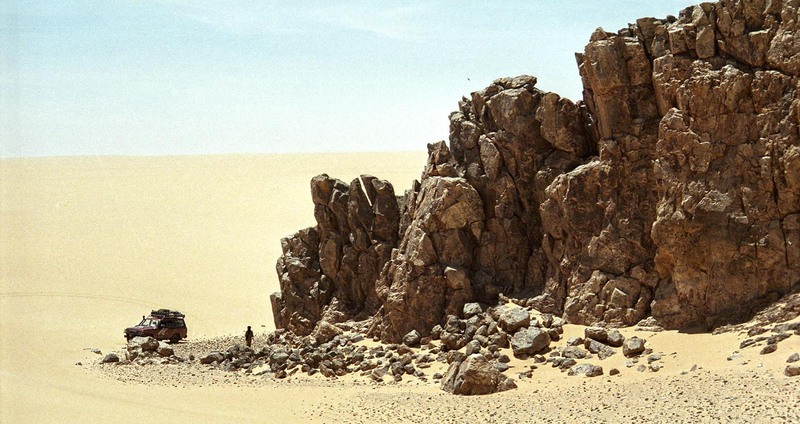 Far off the lone and rarely visited piste which leads from Agadez via the uranium mines of Arlit northwards towards Tam, an elementary zone is waiting, that is very unforgiving. This is an experience that Heinrich Barth had to undergo, as he crossed the area during his “Great Journey” in August 1850. Only the excellent eyes of his Tuareg guide saved the explorer who lost his company on a recon excursion, close to delirium and dying with thirst, facing an atrocious death. With a croaky “Alhamdulillah”, “praise to the Lord” on his lips, the young explorer embraced his rescuers. Our first search area is “Timmersoi”. Translated from “Tamashek”, the Tuareg language, this means “Place of the cadavers”. It’s a broad flat ancient alluvial plain, which spreads from north to southwest across the Tamesna desert, the latter stretching from the Air Mountains to the Algerian border. Based on the geological data that is available for this region, our search area consists of Pleistocene alluvial plains mainly with quartz gravels and to the north of the Tamesma of vast Quaternary regs. Our mission is to find meteorites, extraterrestrial rocks that have rested here for thousands of years in the dust of the Sahara. The statistics of meteorite strikes indicate that 1 meteorite weighing at least 10 grams hits every square mile of the earth once in 1,000 years. To identify suitable search areas, satellite images were reviewed because they show the traces of geological processes often better than topographic maps. A substantial part of preparing the expedition consisted in identifying and eliminating sedimentation zones of relatively younger geological age. In these areas, fluvial or eolian deposits accumulate on the older surface covering any meteorites that might have fallen there in the past. To recognize these younger deposits in the satellite images, we compare it with imagery where the geological activity such as erosion, eolian deflation and sedimentation for typical desert landscapes can be studied in a more exaggerated manner. Mars, with its huge deserts and intense wind Forces, proved to be an ideal comparison. Since the deserts on the “Red Planet” are the product of extreme atmospheric conditions, the Martian landscape gives a far more distinct image of past and ongoing geological processes on the surface. Geomorphological comparisons of Mars Global Surveyor images with LandSat images of the Niger deserts helped us to separate the geologically older and potentially meteorite-rich areas from the younger sedimentation zones. A 120 km behind in Guezzam, we believe we have left the inhabited world far behind. But fresh tracks from at least six vehicles tell us better. Our guides who already seem to know about the mysterious party announce an encounter of a peculiar kind. After only a short distance, the uninhabited Timir oasis comes into view. The few tamarisk (an acacia shrub) owe their existence to an artesian well that springs amidst the Tamesna desert. These artesian sources are evidence of the active volcanic activity of the Air Mountains, which are located not far to the east. Slowly we approach the spot in a wide loop but we have already been spotted by a hidden sentry. From between the bushes shapes appear, beckoning us. It’s a group of smugglers, transporting cigarettes and other goods from as far as Chad across the borders of Libya and Niger and into Algeria. Known as “La Contrebande”, as the Touareg call them, they are legends in the local army dispatches, newspaper reports and horror stories, but there is rarely a foreigner who has ever seen them face to face. About a dozen veiled men gather. Immediately they recognize Aoutchiki “The Locust”. Everyone wants to shake his hand, a large chitchat begins. Abu Yussuf, the leader of the gang, shows us his brand new Toyota pickups. 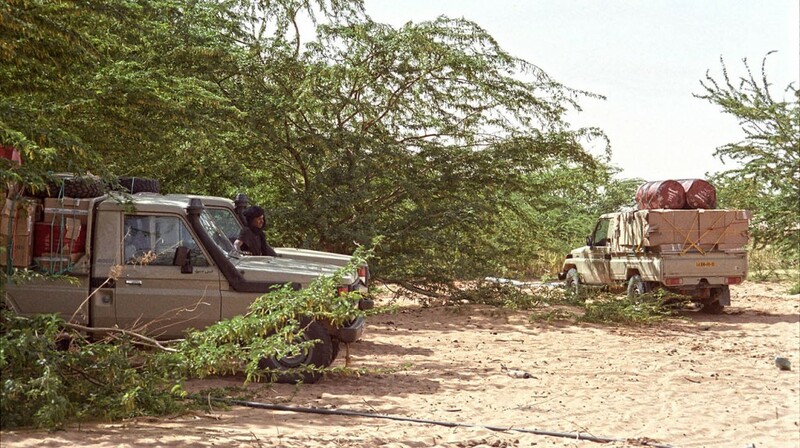 Camouflaged with tamarisk branches and heavily laden with cardboard boxes and fuel drums the brandnew vehicles are hidden under the trees. “Gasoline powered”, he proudly declares, indicating his disdain for the less agile diesel engines. “Every driver is allowed to store his own box of contraband in his truck bed” he explains. “In Algeria they can sell it for a handsome profit” Abu Yussuf adds. In addition to his pay, the driver banks this revenue and is therefore not only a worker but also participating in the financial benefits of the business. Despite these promising opportunities, most of the young men give another answer when asked about their motivation. It’s the danger and the adventure of the business that attracts them. “Always in the risk” is their Motto, a young fellow tells us. And as a matter of fact, they suffer losses from time to time. During the day, the parties are forced to seek cover in the ravines and oasis from the Algerian gunships that keep chasing them far into Niger territory. If a convoy is spotted, it is immediately attacked with unguided rockets and automatic fire from the helicopters. Then, the tactic is to separate and take refuge in different directions. Normally, the helicopters concentrate on a single target, Abu Yusuf smiles. If this target is destroyed, the helicopters return to their bases at Tam or Djanet. Then, the surviving smugglers return to the scene to collect survivors and bodies and to rescue what’s left of the payload. Operating under the cover of darkness provides no more safety. The distances from one hideout to another are long and the remaining time is used to full extent. High on amphetamine, Abu Yussuf’s men traverse the flat desert at speeds in excess of 110 mph. If the driver misses one of the flat sand rims or steers over the fox hole of a Fennek, a serious accident is the consequence. The sand dune fields are tricky as well. At night, rollovers are common, but since the speed is usually slower in the dunes, these are “no big deal” for drivers and cars, Abu Yussuf lets us know. As he notices our camera, he invites me to join him on his tour. He would like us to shoot a film that he could show to the Toyota manager who sells him the pickups. 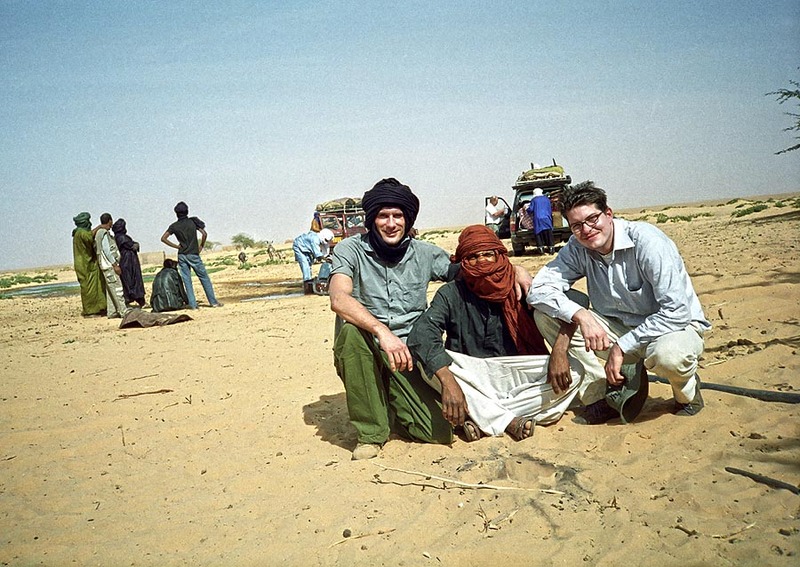 “These corporate types don’t have a clue what their cars are able of.” “La Contrebande”, with more than thousand active vehicles in the Central Sahara alone, is the largest client of Toyota in all of Africa, he says. 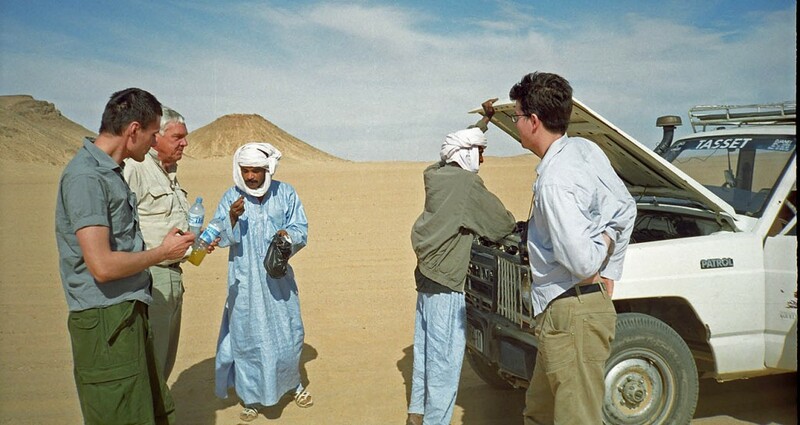 Abu Yussuf refuses to believe that we’re on our way to the Ténéré to search for meteorites. To convince me of his plan, he promises to request a gris gris for me from the medicine man in his tribe. Equipped with such magic, I would be bullet-proof because all projectiles fired at me would surely miss their target. I suspect, this part of his pitch adressed the Algerian gunships. However, we begin to worry for a completely different reason. A strong wind comes up as we continue to our search area. Soon the visibility is reduced to the front of the hood. Yet the feared Ghibbli, the sandstorm that can last several days at this time of the year, holds off. “Just the regular wind”, Elkontchi declares. And he is right. Towards dawn, the wind lets up and we can setup camp for the night and plan our search the next day. At noon the following day, Aoutchiki calls us. He has found something. It’s the campsite of a prehistoric hunting party. Probably during the last storm, the wandering dunes revealed this particular area. Heaps of stone tools, flakes and petrified bones cover the place, unchanged and untouched as it was left by the previous occupants about 10 – 12,000 years ago. Two arrowheads made of green jaspis can be dated because of their distinct retouche pattern. They typically represent the microlithics of the Second Intermediare, the transition of Epipaleolithic and Neolithic age.